We recently experienced our first snow fall of the season. 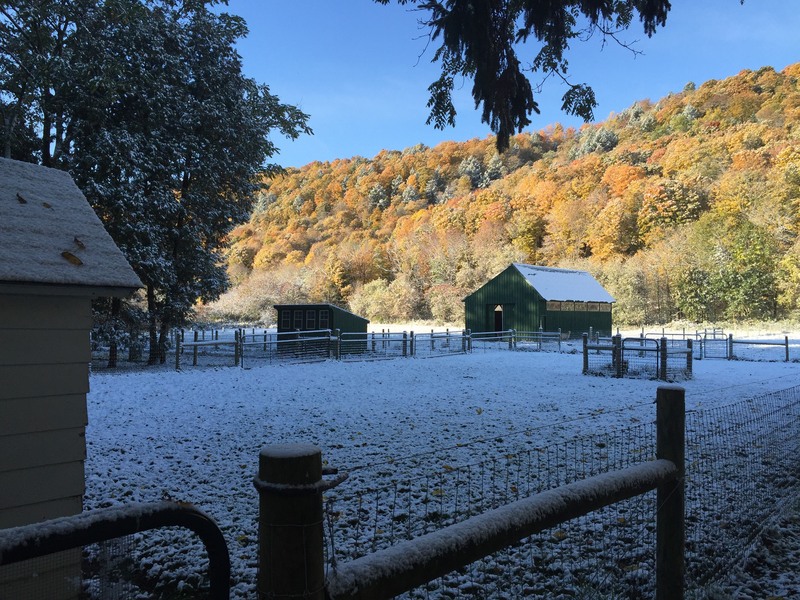 We received around 2 inches of snow in mid-October. 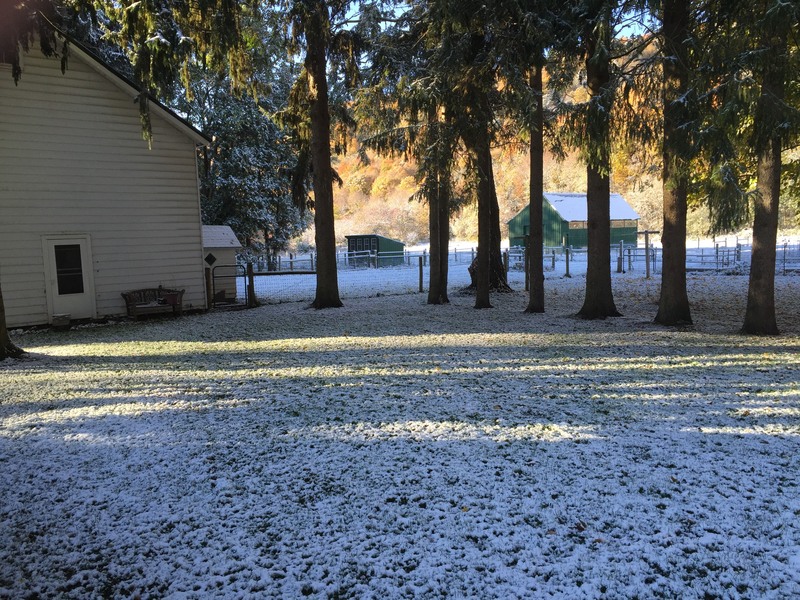 The average first snow fall does not normally occur until early November and the first measurable snow does not normally occur until mid- to late- November so it was a bit earlier than normal. 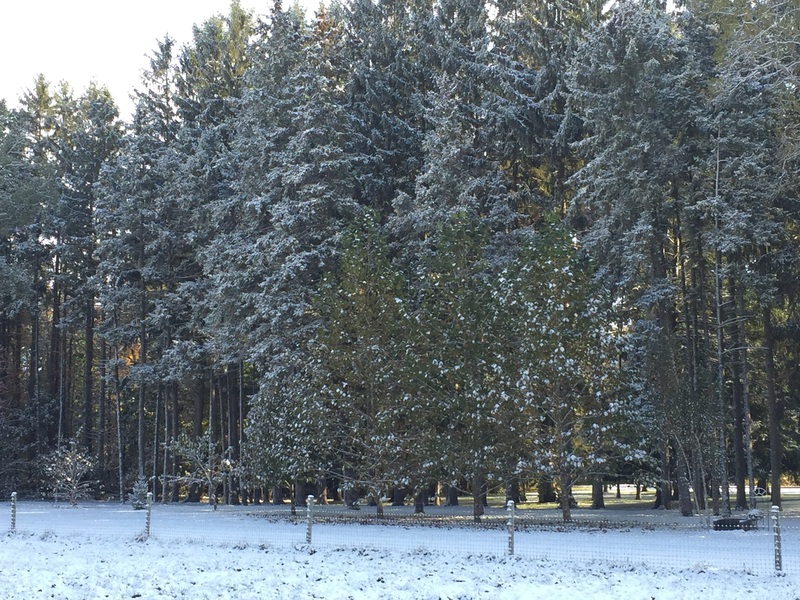 The almanacs are predicting a heavier than average snowfall for the season – we are off to a good start. For reference, average snowfall is over 100 inches per year. 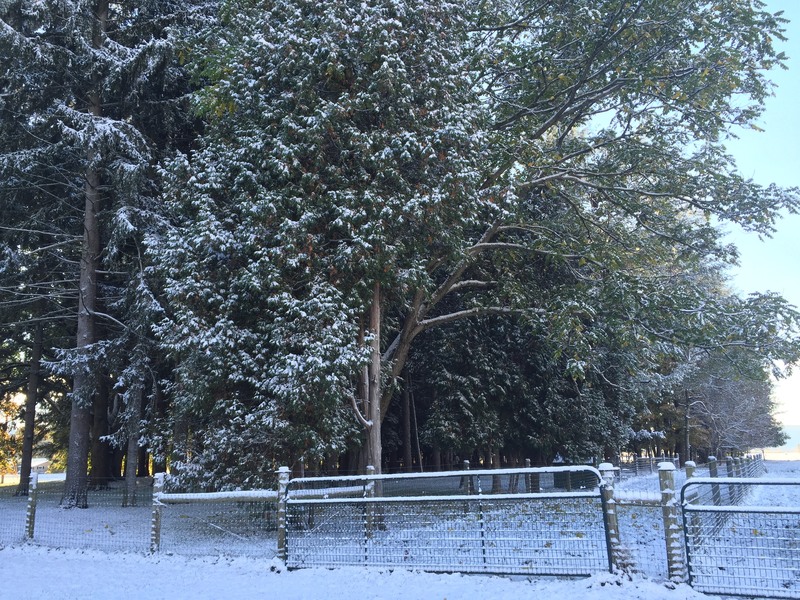 Click through for more pictures of the first snowfall. The goats handled the snow very well. 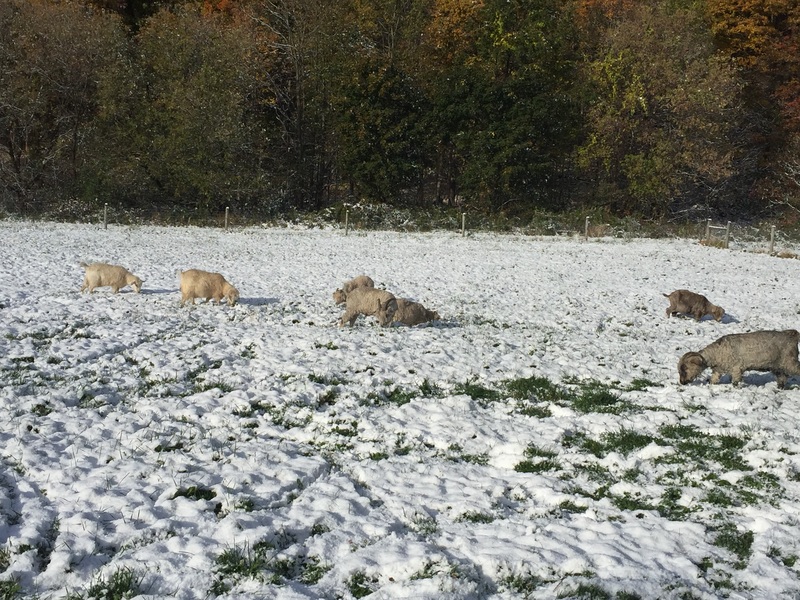 They continued to graze on the grass in the pasture and they didn’t seem bothered by the cold, even though they were just sheared a few weeks ago and don’t have their thick fleece yet. Goats grazing in the snow. 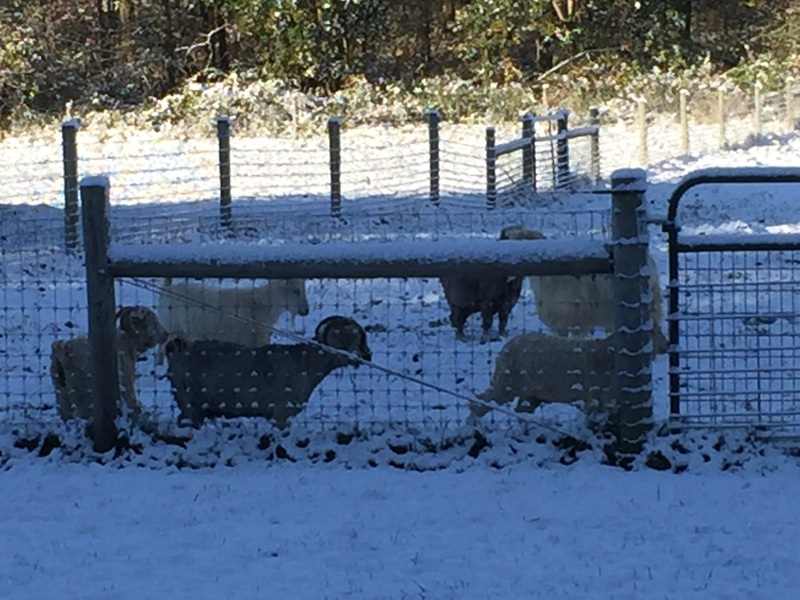 The goats in the snow covered pasture. We had to pull all of water hoses inside before the storm to prevent them from freezing. This means that we now need to start carrying full water buckets out to the animals from the barn. It has definitely increased the daily workload! We also got a chance to test the solar panel broom to clean snow off of the solar panels. It worked well for the bottom row of panels but it was difficult to reach the rest of the panels from the ground. Supposedly brooming off the bottom panels permits those panels to heat up and then the snow on the higher panels will melt / slide off the panels higher up. It was just above freezing during the day, so it was not clear whether it melted any faster after using the broom. It was nice to be back in an area where the snow is beautiful and calm. Near New York City, snow would always turn into puddles of brown slush in a matter of hours and there was rarely time to view fresh snow. We had the chance to just get outside and enjoy the snow. Check back in March to see if we still love the snow. 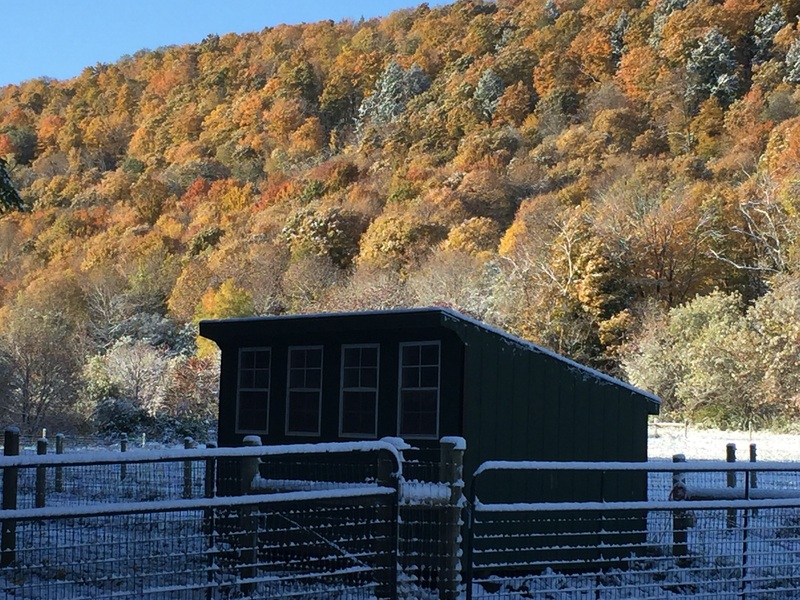 This entry was posted in General Information and tagged farm, Snow by Dan. Bookmark the permalink.